After knitting for almost a solid week on MS3, I am finally pleased to report that I am very nearly halfway through Clue 5. 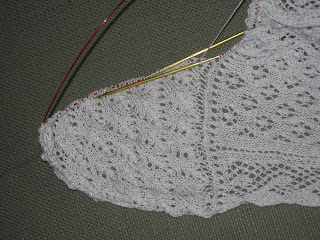 Although unblocked lace is pretty nondescript, I am attaching photos. As mentioned in the last post, I decided to knit the long version of the stole. This will hopefully turn out to be a smart idea in the end but it was a painful two hundred some rows of cat's paw lace. The goal for this week is to finish Clue 6. This goal is overly ambitious but I feel like it is the only way that I am going to have a hope of making it through my UFOctober list over the next 19 days. Mystery Stole is the priority since I need the needles for my November NaKniSweMo project, Eunny's Tangled Yoke Cardigan from the Fall '07 Interweave magazine (and for those who are keeping count, that will be my third project from this issue). At least there is a method to my madness. Posted by Amanda at 7:56 a.m.
Nondescript? Then why does your MS3 look so stunning? 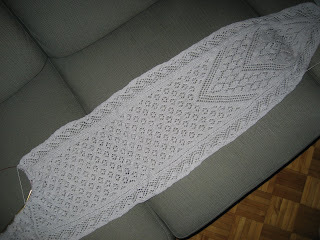 Nice job, and based on how quickly you finished Icarus, I'm sure this one will fly off the needles. October 12, 2007 at 4:24 p.m.
October 12, 2007 at 9:19 p.m.